As with many organizations, the unprecedented growth period since the 2008 recession has been kind to CPNP investments such that we have a healthy financial reserve should the organization experience a downturn or identify a significant opportunity. Beyond those financial returns, CPNP is aggressively investing its new revenues in an array of initiatives designed to expand the reach of psychiatric pharmacists. In 2018, CPNP experienced a positive net income of $80,700. We experience a 2-year business cycle corresponding to the release of the Psychiatric Pharmacotherapy Review Course, and so the 2018 income went into savings to help cover expenses in 2019 as necessary. 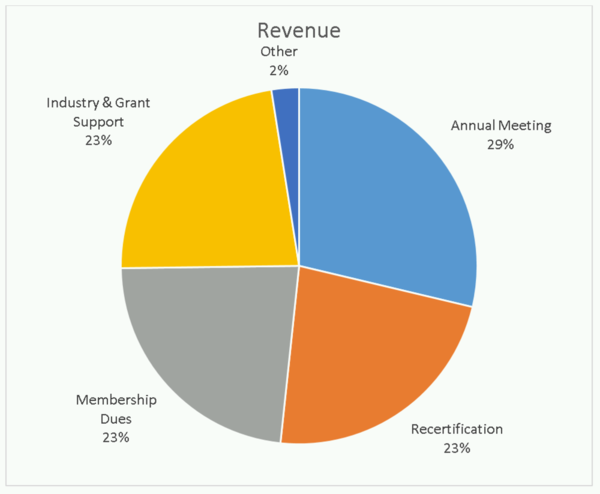 CPNP has developed 4 main revenue streams as illustrated by the pie chart. Annual Meeting registrations, BCPP Recertification Products, Membership Dues, and Industry Support (both educational and promotional) constitute about 98% of CPNP’s operational revenues. The charts illustrate that the Annual Meeting is only sustainable at current registration rates thanks to the generous support of our sponsors and grantors. If you are attending CPNP 2019 in Salt Lake City, please thank the sponsor representatives for supporting our organization and annual meeting and participate in the value-added programming our industry partners are supporting at CPNP 2019. The “Net Income to Reserves” slice has been added below so that the Revenue and Expense charts represent the same total dollar amount. *Staff time is recorded and allocated accordingly to each expense category. The charts also show how BCPP Recertification has remained profitable even as we launched two new recertification products. We are pleased to be able to offer most BCPP Recertification programming at the same cost per hour as we did more than a decade ago when CPNP became the sole BCPP recertification provider! With many changes in the profession related to credentialing, we are monitoring recertification closely to ensure that it is sustainable and remains affordable moving forward even as many BCPPs begin to retire. 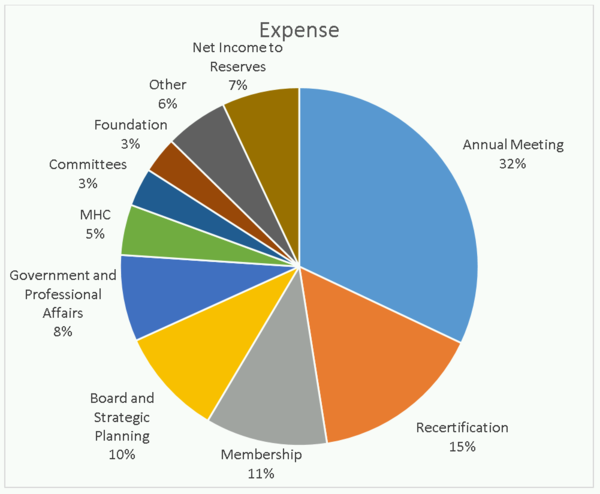 Recertification and the annual meeting represent half of our expenses. The other half of our expenses are expended in supporting a multifaceted strategy intended to expand the knowledge and reach of psychiatric pharmacists. That strategy includes extensive planning, advocacy, professional affairs, consumer relations, residency support, student outreach, peer-reviewed publications, research support, and other initiatives guided by standing committees and short-term task forces. Sustainability is a core facet of the current strategic plan, and efforts are underway to further support the organization through revenue-generating initiatives related to Substance Use Disorders, the Mental Health Clinician, and other key initiatives. If you have ideas for improving CPNP products and services, please email info@cpnp.org. CPNP maintains full financial transparency to members. Members can review the most recent audit and tax return at all times in the member center here.